BUSHWICK — A massive development project with sleek high rises, 977 apartments, two added streets, open space, retail and rezoning of several blocks would transform an industrial area into a mini-neighborhood, developers said. The proposed project near Woodhull Hospital and the Flushing Avenue J train station would include 70 and 80-foot-tall apartment towers with ground floor retail and garages, said representatives for the developer Read Property Group LLC, which has applied to rezone about nine square blocks. The ambitious development would also require additional public school space either in one of the new private buildings or inside the nearby P.S. 145, since Bushwick's elementary schools of District 32 are already to capacity, the representative said, noting that Read was in talks with the city about school space. And the project would also rebuild two streets that were previously demapped in the 1930's when the spot was home to Rheingold Brewery and other breweries, Read's representative Jennifer Dickson said. Stanwick Street between Montieth and Forest streets and Noll Street between Stanwick Street and Evergreen Avenue would both be remapped, she said. Public open areas would also be included in the private property, Dickson noted. "It will include more than 17,000 square feet of public open space," she pledged of the property, noting that Bushwick was already underserved in its amount of green areas. "The building will be 70 and 80 feet. That's why we're putting open space between the buildings." And 24 percent of the units would be affordable housing, she said. The affordable housing studios would cost $830 to $900; one bedrooms $890 to $967; two bedrooms $1,085 to $1,160; and three bedrooms $1,246 to $1,340. But the audacious plan — which must be approved by the city after Brooklyn's Community Board 4 and the Brooklyn Borough President's office make recommendations — sparked a hefty list of concerns from local residents, and Community Board 4 voted to delay their vote on the project. "This area's been polluted for many years. We need an Environmental Impact Statement," said Community Board 4's chair Julie Dent, noting that the lengthy construction could spark asthma and other airborne diseases. 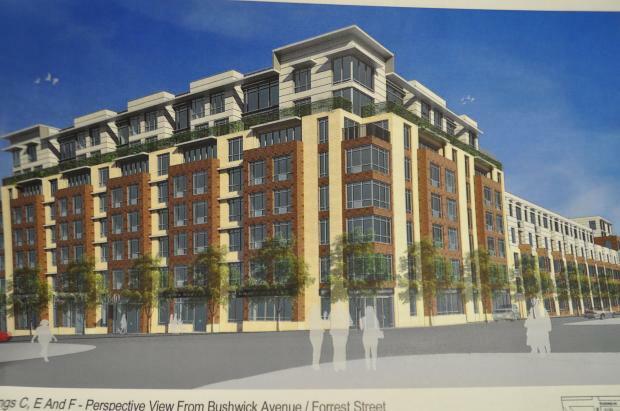 Community Board 4 has recently pushed the city to start rezoning Bushwick to guard against high rises like those proposed by Read, as the area's real estate has shot up in price including an "abnormal" rent increase in one month earlier this year. Meanwhile, the 83rd Precinct's Community Affairs Officer Damarys Franco warned the development area already overflowed with cars and said the garages (for 50 percent of the units only) would not suffice. "There are major problems with parking already," she said. Another resident pleaded Read's architect to "make this [development] look like it belongs in Bushwick, not Indianapolis" and others demanded that the developer promise to bring local businesses into the retail space. "They're going to try to include local businesses," replied Dickson, and said Read would consider the criticism to the buildings' architecture as well. Still, other residents claimed the developer should include more affordable housing and specify how much the non-affordable units would cost, at which Dickson said the company would consider locals' comments. Bushwick's Community Board 4 has not yet set a date for their next meeting to vote on the proposal.